Yeah, they taste crazy good. So I knew I had to put them on the blog. A tad messy but holy yum. Prepare the brownies as directions indicate. Cut brownies and place them onto a wire rack with a drip pan at the bottom to catch any chocolate or caramel that might drip down. While brownies are cooling heat in a double boiler the chocolate and the butter until it becomes smooth and has a sheen to it. 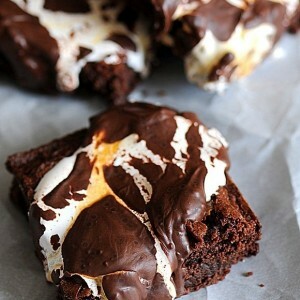 While still slightly warm add a spoonful of marshmallow fluff onto each brownie. How many brownies you get depends on how big you cut your brownie. I cut mine pretty big. The marshmallow will start to spread. Put a spoonful of caramel on top of the marshmallow. It will also spread a little. Then spoon some of the chocolate on top of the marshmallow and caramel. It will spread as well but will eventually harden back up. When the chocolate has hardened again they will be ready to serve. Clearly these are messy to eat but ridiculously good.